nanoHUB continues to empower higher education faculty who want to incorporate cutting-edge nanotechnology topics into their classrooms with a workshop held in October. Titled “An Overview of nanoHUB Instructional and Research Computational Resources for Community College and University Faculty”, the workshop reached attendees across Texas. Participants came from Houston Community College, Northwest Vista College (San Antonio), the University of Houston, Prairie View A&M University, Clarkson Aerospace, as well as the National Science Foundation’s Division of Materials Research. The workshop was led by Dr. Tanya Faltens, Educational Content Creation Manager at the Network for Computational Nanotechnology at Purdue University, and Bartlett (Bart) M. Sheinberg, Director of the West Houston Center for Science and Engineering at HCC. “The basis of the workshop was the ability to provide computational modeling simulations to community college and university faculty, and discuss how the resources provided by nanoHUB can be applied to instruction and research,” said Sheinberg. Faltens and Sheinberg connected at the nanoHUB workshop on simulations for materials science and engineering at a recent conference of the American Society for Engineering Education in Salt Lake City. “I happened to meet Tanya at the workshop she was giving and said, ‘This would be a great thing to bring back to Houston,’” said Sheinberg. 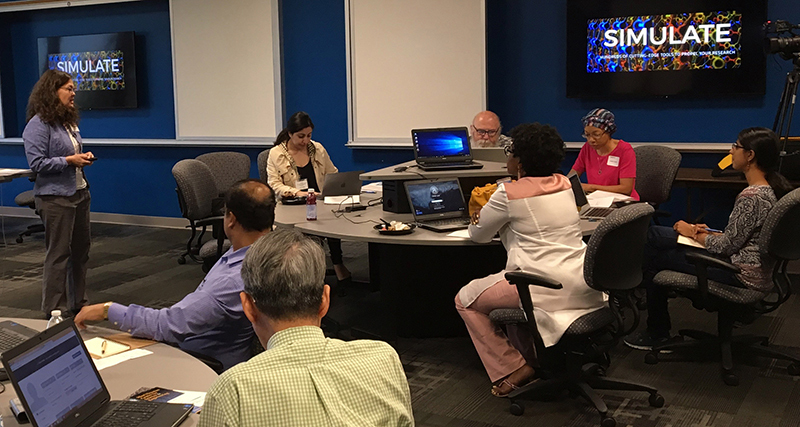 During the six-hour Houston workshop, participants learned methods for using nanoHUB tools to simulate carbon nanotube geometries, band structures and electrical properties, quantum dots, and more. Other activities included sharing control of simulations with other members of a group, saving simulation results and sending them to others, accessing stored simulation results in a nanoHUB filespace using WebDAV, and getting help via nanoHUB’s ticket system. Attendees left with the ability to use nanoHUB tools and resources in their biology, chemistry, materials science, electrical engineering, physics, and nanotechnology courses. Workshop attendees collaborated in a nanoHUB group focused on undergraduate education: https://nanohub.org/groups/ug_workshop. Instructors interested in joining the workshop group may send a request for access to the group’s manager. Visit the link and then click the “Request Group Membership” button to get started. Another useful starting point for anyone looking to learn how to use nanoHUB is the Education page (http://nanohub.org/education) which features learning communities, nanotechnology topics, and popular tools.